2010 model Caterpillar Trailer Power Units X 4 These units were mounted on a wharf to power ships when they were loading and unloading in the South Pacific. Now surplus to requirements. 2000kw standby 480 volt, 3 phase, 60hz Caterpillar digital control panel Woodward Paralleling Circuit . 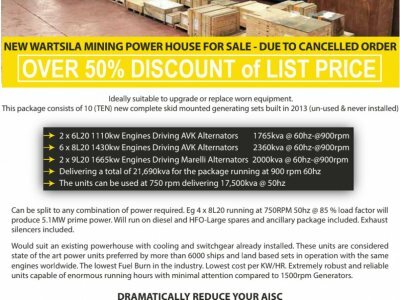 . .
NEW Wartsila Mining or Marine Power House engine driven Alternators. These units were ordered for 2 ships but order was cancelled before they were installed. Still in the crates never been used. New price for all ten units plus spares is between 7 and 10 million pounds. Will sell the whole lot for . 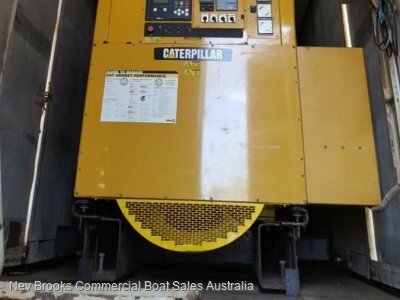 . .
Caterpillar C280 offshore power modules -We have 7units of new caterpillar C280 offshore power modules for sales. 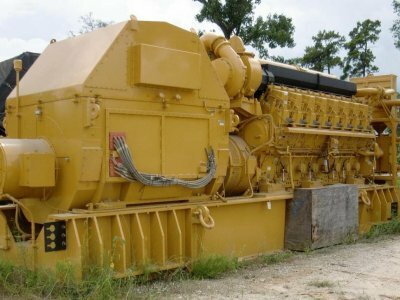 They are 50Hz, diesel, 5.2MW each and are brand new sitting at Port of Houston. The price is $1.9m USD each for these units if you order today from Caterpillar the cost would be around . . .